It’s hard to keep track of all the various special edition versions of Majora’s Mask, especially now with the new handheld and all the accessories that have been announced. 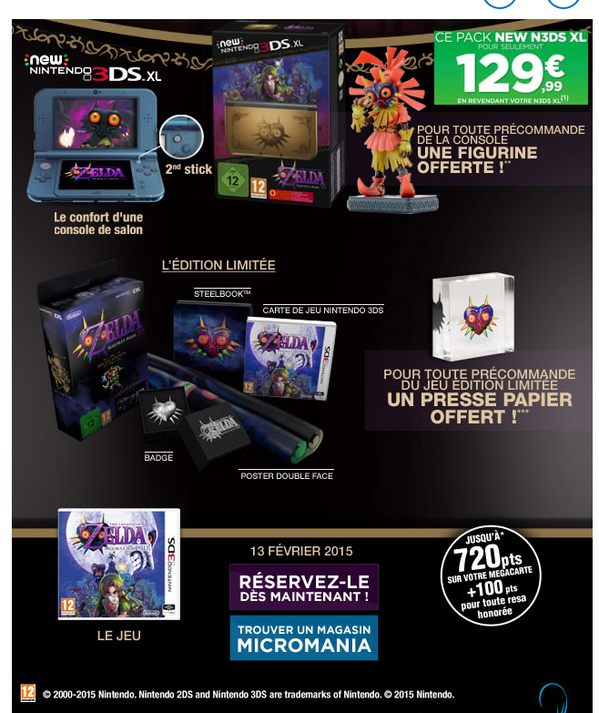 However, if you are a French Zelda fan, you might be in luck. Link’s Hideaway is reporting that a poster has surfaced showcasing a copy of Majora’s Mask 3D, the Limited Edition Skull Kid statue, the ‘New Nintendo 3DS Console’, the Steelbook, the double-sided poster, and the paper weight pre-order incentive. The 129.99 Euros in the image isn’t the price, but rather, a credit for trading in your old Nintendo 3DS. In any case, make the jump to check out the full image of the poster. At this time there is no information as to which retailers will have this bundle available, or what the price will be.